It's less A Design For Life, and more an ambition for promotion and a successful Euro 2016. 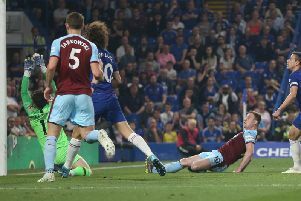 But Clarets striker Sam Vokes hopes he can follow up his musical bow with the Manic Street Preachers with a double celebration. The frontman recently, with Chris Coleman's squad, helped the South Wales band record Wales' official anthem Together Stronger (C'mon Wales) after qualifying for France, their first major tournament since 1958. In the meantime, Vokes, named the Championship player of the month for March on Friday morning, is focused solely on helping Burnley back into the Premier League, with six games remaining, starting with the visit of former club Leeds United this lunchtime. And the 26-year-old enjoyed taking time out recently in the recording studio with Nicky Wire, James Dean Bradfield and Sean Moore: "Luckily I didn't get a solo! "It was brilliant, it was good to be a part of it, there is a video so I'm sure you'll get snippets of it when it comes out. "But it was good fun, and the Manics were great to work with. "We didn't have time to learn the lyrics, but we had a sheet, and it was a good craic. "We for chatting to them after and they were nice guys. "They were talking about Burnley and how well we're doing, the run we're on, and wishing us all the best, so it was good. "It's the first time any of us have been involved in a tournament and it's massive, something to look forward to." Vokes is renowned as the dressing room DJ at Turf Moor, and he smiled: "Unfortunately I don't play any Manics, I might have to start dropping that in! "In the dressing room we usually have some house music on, but outside, I listen to a bit of everything, indie, a bit of Kasabian, it's good." So while it's doubtful you'll hear the Holy Bible booming out of the changing rooms before today's game, Vokes is in the mood to help Burnley to another vital three points. He missed the run in to promotion two years ago after suffering a ruptured cruciate knee ligament, and he said: "It was gutting two years ago when I missed the run-in, when it was as tight as it is now. "They are the games you want to be involved in and that’s given me the extra motivation to push on for the last six games now. “I missed the run-in last time so for me it’s great to be involved in this and have six cup finals in the last six games. "I don’t think there are any nerves in the dressing room. I suppose as a club you get to that point where there are six games to go and everyone is on edge.